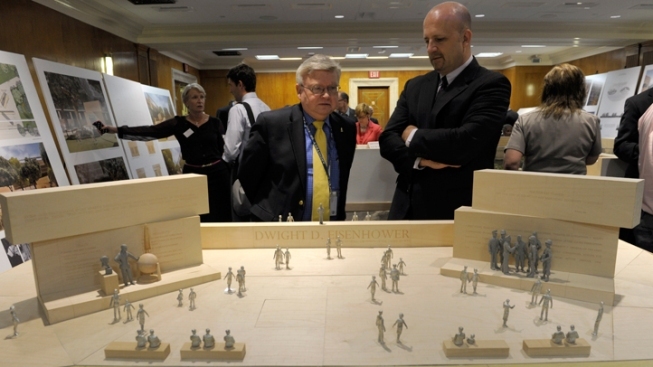 A key arts panel has approved a revised design for a memorial to honor President Dwight D. Eisenhower in Washington, which could clear the way for groundbreaking. The U.S. Commission of Fine Arts voted Thursday to approve Frank Gehry's design. A federal planning agency also recently approved the design. The Eisenhower Memorial Commission that's working to build the $140 million project says the approvals clear the way for groundbreaking in 2015. Congress must still fund the project, however. So far, $63 million has been appropriated. The memorial group has $25 million of that on hand. But critics, including Eisenhower's family, have delayed the project. Gehry designed a memorial park with statues of Eisenhower. A large metal tapestry depicting the Kansas landscape of his boyhood home would serve as the backdrop.